Nissan Skyline 350GT Spec - J's Garage Export Co., Ltd.
2003. 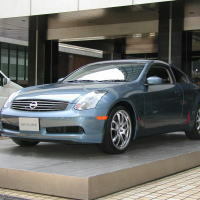 1 : NISSAN announced the release of the fully redesigned Skyline Coupe. The Skyline coupe is powered by the NEO VQ35DE engine that produces 280 horsepower (206 kW) and 37.0 kg-m of torque for impressive driving performance. Additionally, the Skyline coupe adopts a long wheelbase with a central occupant seating position, a wide track and large-diameter tires to provide smooth and agile handling. Standard safety features are Xenon headlamps, VDC (Vehicle Dynamics Control), the driver and front passenger SRS side airbags, SRS curtain airbag systems and front seat active head restraints. 2004.11 : There was some minor changes. The Skyline 350GT coupe has adopted 19 inches alloy wheels, aluminum center cluster, and sport-tuned suspension (19in alloy wheels). 2005.11 : There were some minor changes including mild facelift and rear combination lamps. The Skyline 350GT premium coupe has adopted 18 inches alloy wheels (AT), aluminum speaker rings, leather convention seats, full auto air conditioner with dual mode, auto headlights levelizer, and dual-flow-path shock absorbers.